I'm stopping by to show you a really quick and easy DIY (its so easy there are no steps). Even though the leaves are clinging to the trees, winter is very nearly here which means we all get to wear loads more (fake) fur - whoop! I made this fur scarf last week, it took me about 7 minutes and I'm just a little bit in love with it. 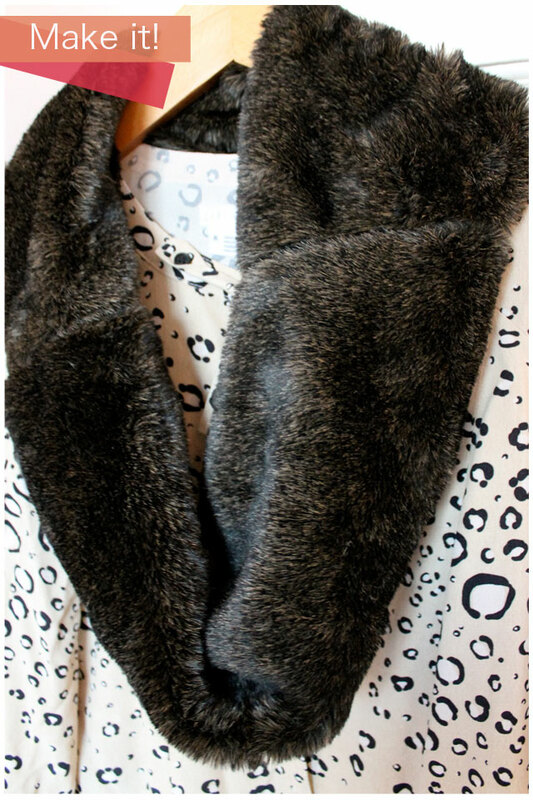 To make you need a piece of fur either approx 1m x 30cm or 2 pieces 50cm x 30cm, a needle and thread or sewing machine. All you do is line up the ends and sew together (if you are using a sewing machine keep your stitches really long). You can line it but it rolls over on itself quite naturally so you can get away with skipping this step. I would normally recommend an online fabric shop, but with fur you need to see it and touch it so take a trip to your local fabric shop and pick something really scrummy, it shouldn't cost you too much at all, I think this cost me about £4. Happy making! So easy - thanks for the inspiration and the reminder that not all projects need to take ages of time! Exactly - not all projects need to take ages. This is fantastic and I love how simple it is to make. And the best part is that it looks so luxe! !